Helen & Chris Road Trip USA: CKU!! CKU. Stands for Creating Keepsakes University!! Creating Keepsakes is the 'leading' scrapbook magazine in the USA and very proactive in promoting the craft. It was a 3 day convention I suppose is the best way to describe it. Lots of classes, projects, time to work on your own stuff in the 'crop' hall, great chance to meet new friends with a like-minded hobby. Fantastic experince. Was maxxed out the whole time with non-stop business - they only gave us an hour between classes and evening activites on some days! Busy from 9am till midnight!! I have so many projects I worked on. Mostly Scrapbook pages - I normally create 12x12" pages but here we were using different sizes - we created a whole album of 6x6" pages - 8 different classes with 8 different teachers with different styles and products - very cool - all I need to do now is finish it off with my photos and some journalling! 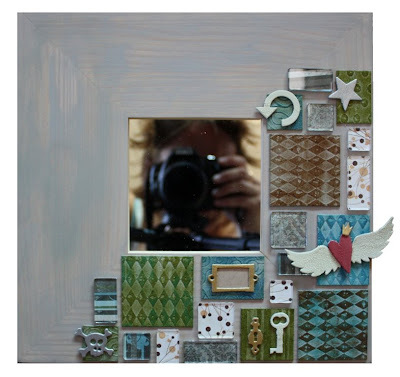 Also created a fab mirror! Loved this class - so many new techniques for me and I could even get into the messy play thing and start using paints! The main thing I realised I can't fully embrace Scrapbooking until I have a much larger space to collect products, tools, papers, paints - an RV isn't ideally suited!! I came home with 2 bags full to bursting with goodies we'd been given and all my new projects!! These are all the goodies and even here I have stuff tucked away in bags so there's even more than it looks!! Now I have to find homes for all this! I ain't complaining!